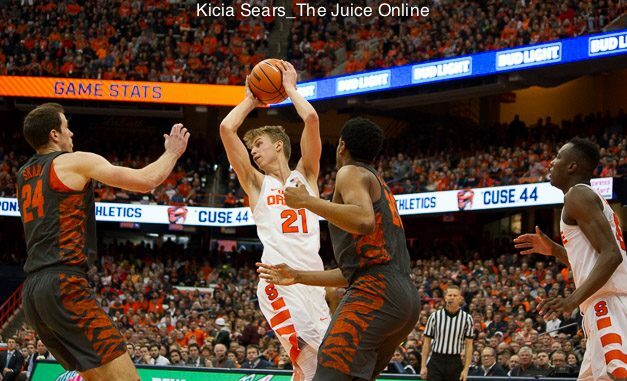 Marek Dolezaj looks to pass during Syracuse's game against Clemson. Mandatory Photo Credit: Kicia Sears, The Juice Online. Syracuse has a Marek Dolezaj problem. He’s the team’s best passer and most efficient player. But coach Jim Boeheim has not found a way to utilize him on offense. It was expected that Dolezaj’s minutes would fall with the addition of Elijah Hughes (they have). But even while he’s on the floor the team has not figured out how to involve the 6-10 Slovakian. Dolezaj’s usage percentage, which indicates involvement of a player while on the court, is 10 percent. By comparison, Tyus Battle’s is 23 percent and Buddy Boeheim’s is 22 percent. Dolezaj’s field goal attempts per 40 minutes are down from 5.7 a year ago to 4.6. He takes just 8 percent of the Orange’s shots while on the floor. But just like his slight, 180-pound frame belies his toughness and hustle on the court, Dolezaj’s box score numbers conceal his true value. This season, Dolezaj’s true shooting percentage, which accounts for free throws and 3-point shots, is 66 percent. That’s the same as Paschal Chukwu, who literally only shoots dunks and layups. For you non-basketball junkies out there, that is absurdly high. The next highest on the team among guards and wings is Hughes at 57.5 percent. Additionally, Dolezaj assists on a higher percentage of field goals than anyone other than Frank Howard, the point guard. (Yes, this includes Jalen Carey, the back-up point guard). 1. The pick and pop. Syracuse often uses Dolezaj as a high screener, but it’s often to clear space and he rolls to the weak side, not looking to get the ball back. When he does pop, it’s rarely designed as a shot opportunity. Dolezaj quickly swings the ball to another player on the wing. Dolezaj is shooting 50 percent on 2-point jumpers away from the rim, which is roughly two times better than Oshae Brissett (26.4 percent). Even if he does not pop to the 3-point line, he should be looking to shoot more. And the coaches should be encouraging this. 2. Shoot lots of 3s. Continuing the above, whether on pick and pops or otherwise, Dolezaj should be looking to shoot more 3s. He’s currently shooting 46.7 percent, which is easily the best on the team, albeit on a scant 15 attempts. But let’s say Dolezaj turns those 0.4 attempts per game into 4.0 per game (what Brissett takes), and his percentage drops by 10 percent. That’s still a 55 percent effective field goal percentage, which is literally more efficient than any Brissett shot – Brissett shoots 52 percent at the rim. Over the course of a game, swapping Brissett’s attempts for Dolezaj’s alone would add 1-2 points per game to SU’s score on average. 3. Post up. During his time in the Virginia Tech game, when he wasn’t setting high screens and immediately clearing out, Dolezaj spent a lot of time on the weak side of the court. The team was busy posting up Brissett and running dribble drives off screens for the guards. Never was Dolezaj the first, second or third option. But Virginia Tech is the perfect team for Dolezaj to post up against. They play small, and he had several inches on his defender on most plays. The concern with Dolezaj is that he’s so light that he will get pushed around by big men inside. But posting up does not need to mean backing down a defender to the hoop. Using his height, he could find cutters – like his sweet backdoor looks – or kick out once the defense starts to collapse. He could also turn and face for a mid-range jumper. 4. Bring the ball down the court. File this under things Boeheim will never do. There would be too much concern about Dolezaj’s poor ball handing. But given the match-ups Dolezaj ends up with at the 5, or even the 4, he is perfectly capable of taking his defender off the dribble when there is no double team. And if the double comes, Dolezaj is the best passer on the team and ready to take advantage. What would Dolezaj do bringing the ball down the court? Teams like Virginia Tech have said their game plans were to deny Battle and Hughes the ball. It’s unlikely they would immediately double Dolezaj. Syracuse should clear space for him and allow him to drive against slower big men. Allow him to draw fouls or kick out to SU’s 3-point shooters. 5. The high post. This is an area where Syracuse has used Dolezaj effectively at times this season. As SU’s best passer, Dolezaj is a zone killer around the elbows. He could be the same against a man defense, but SU’s offense doesn’t operate this way. Not once against Virginia Tech did SU get Dolezaj the ball in the high post. Instead, they posted Brissett and tried to beat the Hokie’s harassing defense with guard play. It didn’t work. To be fair to Boeheim, part of the responsibility lies with the guards for not getting Dolezaj the ball. But the bigger culprit is Boeheim himself. The offense is not designed to get Dolezaj the ball, and he would say as much. But in a basketball world increasingly driven by efficiency, taking your most efficient player out of the game plan is obviously a mistake. Dolezaj presents all sorts of mismatch problems for opposing defenses. He’s too tall for guards and too quick for bigger centers. To take advantage of this, Syracuse doesn’t need Dolezaj to shoot 18 times per game, but it should be getting him the ball every time down the court. Even if his efficiency falls with higher usage, he’s still likely to be one of SU’s best options.